Nancy Stevens, MKFM’s Arts Correspondent attended (The Road) at Milton Keynes Theatre. In all honesty, I do not know to what to make of this play. It is neither an opera nor a musical, but rather a drama with music. 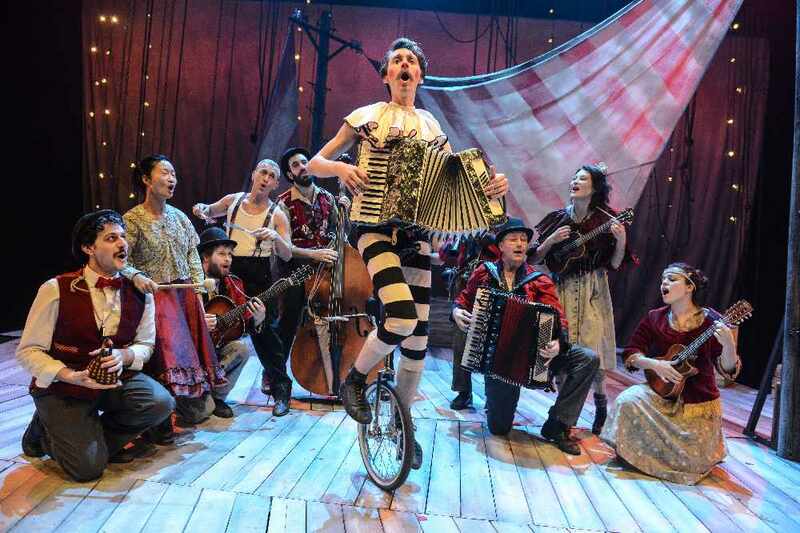 It tells the story of Gelsomina (a gamine Audrey Brisson) who is sold by her impoverished mother for 10,000 lire to a travelling performer, a strongman, Zampano (Stuart Goodwin). She is forced into a life of drudgery, dominated by Zampano, but cannot leave. On the road, on which they constantly travel, they meet a clown, IL Matto (The Fool) played by Bart Soroczynski, whose sprightly energy charms her and forces her to think that her life could have some meaning. Zampano becomes aware of her changed attitude and in a jealous rage accidentally kills IL Matto. Gelsomina loses herself into an almost catatonic sadness, and Zampano, unable to cope with her grief, abandons her. Some years later, on returning to her village, he discovers she has died of sorrow, and then, and only then, does his regret consume him. It is not a happy tale, but I found it thought-provoking and unusual. The sound production was superb, but I was left puzzled by the many ladders up which many of the main characters spent a large proportion of the play. I am guessing this was metaphorical. The actors played their instruments on stage which gave a feeling of cohesion, making it part of the story. As this show was circus-centred, I was hoping for more trickery, something a little more ‘Barnumesque’, but then it is Fellini, not renowned for froth and frippery. I did, however, gasp in admiration at The Fool's combined unicycling and accordion-playing. Gelsomina's singing was exquisite but this was only demonstrated at the end. Although the show was not entirely my taste, the audience loved it. It was very warmly received with a few "bravos" thrown in, and overall was a fascinating production. La Strada on at Milton Keynes Theatre until 25th February.